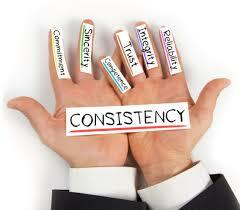 CONSISTENCY -The achievement of a level of performance that does not vary greatly in quality over time. Recently I was having a conversation with a mentor. I had been reflecting on the year and what I had Like many years (actually most) I have fallen short of my goals. She asked me why I felt that happened. Starting off I said that I thought I had been hiding out – even grieving as I have shared with many of you over the months. Grieving a move. Grieving a life change as children are off on their own. Grieving a body that no longer allows for overindulgences without consequences. I could go on, but you get the point. As she asked me questions one area I was encouraged by was the time I have had this past year to reflect. In doing so I have made a list of words and phrases that have stood out as being important for my life – at this time. My plan was to start sharing these via Facebook Live, a regular blog post, or some other platform. Once again, however, I have not gotten to it. The first word/thought I had written down was CONSISTENCY. As we talked about life and business, she reminded me that few things are really like “riding a bike”. You may not forget HOW to do something, but the process is much easier to continue than it is to stop and start. Eating right, exercising, building relationships, working your business, honing a skill, being a valued member of a group – all of these can be REMEMBERED – we don’t forget they are important. The key to all of them is CONSISTENT effort and attention. The same is true in creating value in our BNI membership. In BNI we create an atmosphere of expectations and accountability. We expect our members to show up weekly, to be looking for referrals, to schedule One-to-Ones, to educate themselves on best business practices, and to participate fully in the chapter culture. I can do all of these things sometimes, but the true magic happens when I build upon my performance, grow my skills, and CONSISTENTLY bring value to the chapter. Again, CONSISTENCY is the key component. As you take time this month to reflect on what you want to be remembered for, I challenge you to honestly look at your past performance. Have you been CONSISTENT in those areas that would bring the most value to you, your family, your BNI chapter, your business, and your community? Are there areas you would like to improve upon or even start doing that you have stopped doing? Are you willing to be accountable for CONSISTENT efforts to a mentor or to your BNI chapter? Are you ready to change?